Cape fuchsia Pink Sensation has creamy pink flowers and reaches only about 2 feet tall. 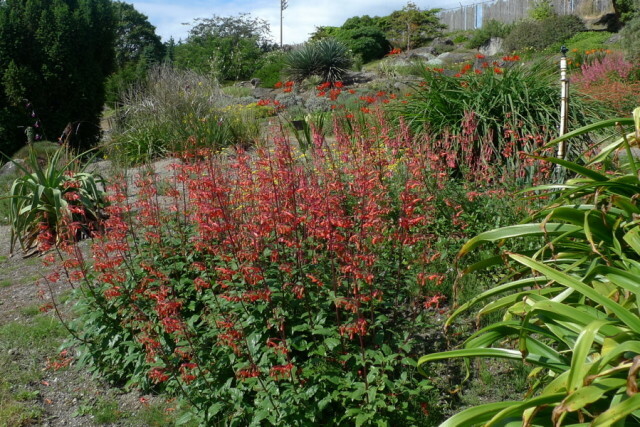 It is definitely less rambunctious than most Cape fuchsia, both in height and spread. Colorful, adaptable and feisty, Cape fuchsia (Phygelius) is a great garden plant that works wonderfully in summer containers, too, thanks to a seemingly endless supply of blossoms appearing reliably from spring to fall. Flower color ranges from pale, buttercream yellow and soft coral to vibrant pink, soft red, and bright apricot orange. There is even an ivory white form. Many orange varieties have a creamy yellow interior. The colors are so soft, and all vary ever-so-slightly from one another, which makes them extra fun to play against other plants. There are dozens of named varieties on the market – some seemingly identical and others just different enough to make one consider becoming a Cape fuchsia collector. One word of advice: you can’t really tell which shade of red or orange the blossoms are from the tag so if you’re looking for a particular shade, look for plants in gallon size or larger pots in summer, when they will be in flower and you can see the color for yourself. This magnificent clump of Cape fuchsia at the University of British Columbia Botanical Garden in Vancouver, BC is flocked with hummingbirds all summer. The name Cape fuchsia refers to the Cape of Good Hope, a rocky headland on the southern tip of South Africa. 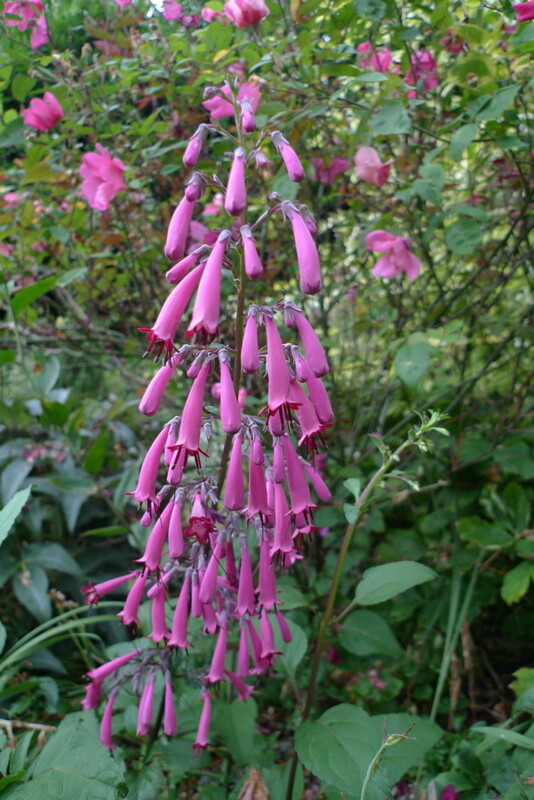 Both species of Cape fuchsia – Phygelius capensis and Phygelius aequalis – are native to South Africa, growing in damp areas along streams and on grassy hillsides. Plants are generally about 3 to 4 feet tall, depending on the variety and the amount of water they receive. I must admit, though, that my established clump of an unknown cultivar of Phygelius x rectus, a hybrid between the two species, is practically taller than me, and I’m 5’ 5" ! A few dwarf cultivars are available, too, which reach about 2 feet tall. Cape fuchsia is semi-evergreen, retaining green foliage and woody stems through mild winters and dying to the ground in cold winters. Positioned in a damp, sunny area in the garden, Cape fuchsia will quickly fill in space. In fact, some find it fills in too quickly. It spreads by underground stems and rooting underground branches. It is usually polite during its first couple of years, but once established, winds through other plants, popping new stems up in the middle of shrubs and perennial clumps and towering over them. Any nearby plant that is shorter is likely to be overwhelmed. A peachy Cape fuchsia – maybe Peach Trombone – is here planted with pheasant grass (Anemanthele lessoniana), Pelargonium sidioides and purplish-pink Calibrachoa. So how to best position Cape fuchsia in the garden so you can enjoy it without fretting about it overwhelming other plants? Plant it in a constricted space between sidewalk and wall, keep it in check with a shovel every spring or grow it in a less damp (sub-optimal) area of the garden where it will grow less rambunctiously. 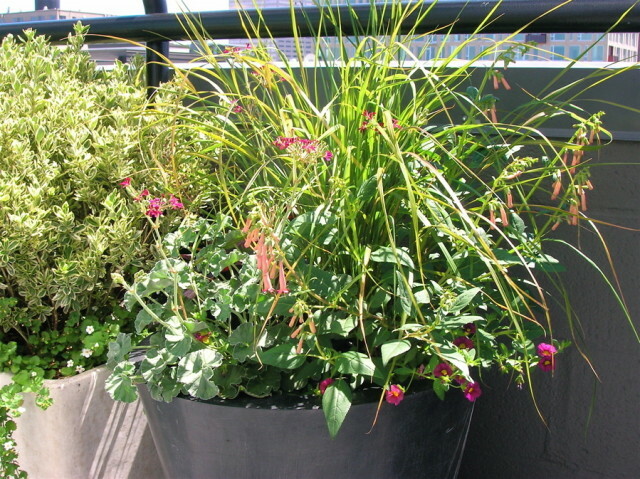 Another great option is to plant it in a container as a seasonal plant, amidst grasses and annual flowers, where it will provide summer-long beauty and fodder for pollinating insects and hummingbirds.